The configuration of the i7 X99 that AVADirect sent us comes as close as any PC I’ve seen to perfectly melding class and gaming flash. I was not alone in my opinion. No fewer than three of the staff here at PCWorld commented on this gaming system’s good looks—a rare event for anything not Apple or thin-and-light. Of course, AVADirect has to share the credit with Corsair for the Graphite Series 760T case, as well as with EVGA for the GeForce GTX980 cards with their glowing neon-green call-outs. I did mention that the i7 X99 is fast, didn’t I? It is. With such a beautiful interior, why use naked DDR4? 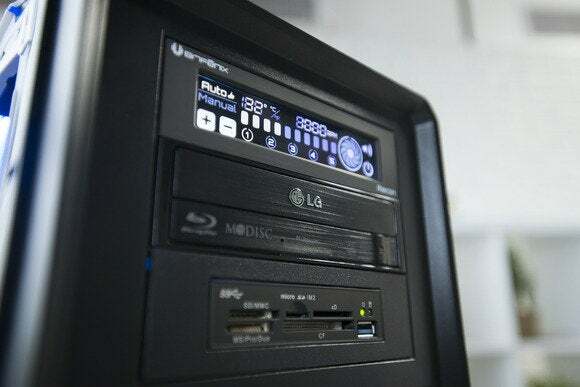 Our $5,150 configuration sported a socket LGA 2011-v3 Core i7-5960X CPU (currently the fastest non-Xeon CPU Intel makes), an Asus X99-Deluxe motherboard, 16GB of Corsair DDR4/2133 memory, and a 1TB Samsung EVO 840 SSD as primary storage. The latter is augmented by a 2TB Western Digital WD2003FZEX WD Black hard drive for those with lots of games and digital stuff. Dual EVGA GeForce GTX 980 SuperClocked ACX 2.0 graphics cards in a SLI arrangement take care of the gaming chores. Cooling is courtesy of a Corsair H100i Hydro with a large twin-fan radiator, while another Corsair product, the AX1200i, supplies power to it all. 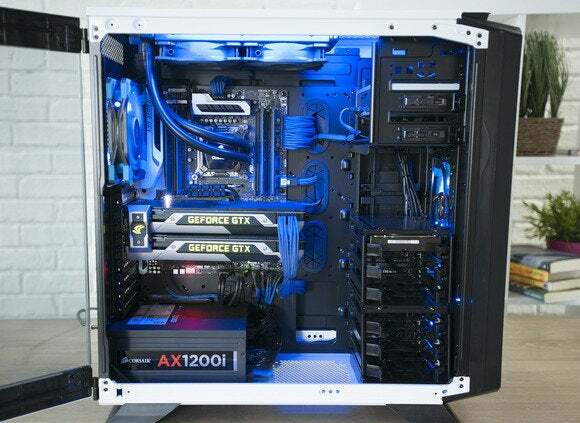 Braided cables and tastefully donhe blue lighting classes up the interior of the AVA Direct i7 X99 PC. 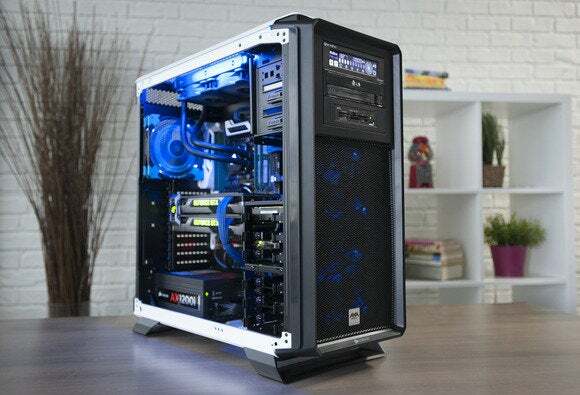 Part of the reason the i7 X99 exudes class is bling restraint: opaque black rather than neon coolant lines allow the blue ambient lighting and the GeForce logos to have their proper impact. If I have any negative comment, it’s the lack of heat sinks (useless as they actually are) on the DIMMs. This makes for “blemishes” of circuit-board green on an otherwise pristinely ominous interior. I got over it. I rarely get case-envy, but the Corsair 760T invoked a twinge. Hinged see-through suicide access doors? That’s good stuff there. There’s plenty of room for more storage: six 3.5-inch side-facing drive bays, three externally accessible, front-facing 5.25-inch bays above that, and two 2.5-inch SSD mount points (one filled) on the back side of the backplane. The backplane also has nicely located raceway tongues and entry grommets that facilitate neat cable runs, and props to AVADirect for taking the time to make them so. 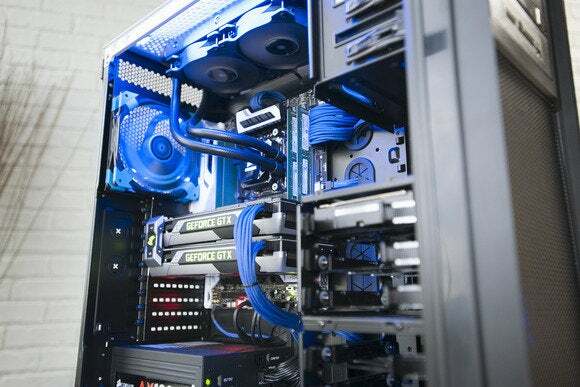 The cabling is blue, which marries well with the blue lighting. A Bitfenix fan controller adds a piece of flair to the AVA Direct i7 X99 PC. The number of ports on the i7 X99 is just this side of ridiculous. On the front upper lip of the unit are two USB 2.0 and two USB 3.0 ports, as well as a headset jack. On the back are an additional 10 USB 3.0 ports, dual gigabit Ethernet ports, three antenna jacks for the onboard 802.11 a/b/g/n/ac, as well as analog audio ports for the 7.1 DTS sound. There’s also an optical audio output. Each GTX 980 provides three full-sized DisplayPort ports, one full-sized HDMI port, and a single DVI-I port, for a total of ten video outputs. For slots, you have the two PCIe 3.0 slots filled by twin GeForce GTX 980s, plus two more of the same type that are uninhabited, should you ever want to go quad. There’s also a x4 PCIe 2.0 slot if your needs are more mundane. There are eight 6Gbps SATA ports plus a SATA Express port. On the front of the PC, occupying two of the externally accessible bays, are a Bitfenix Recon fan controller and a multi-card reader/IO bay. There’s also a Blu-Ray recorder for loading games from disc. 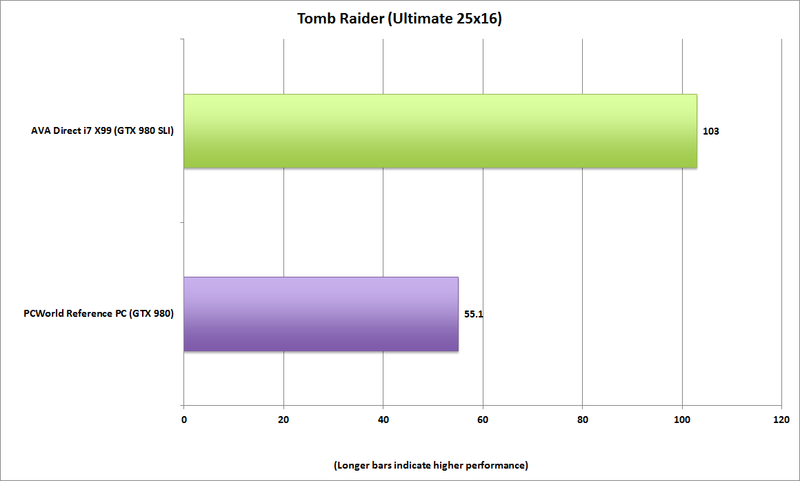 We run Tomb Raider at 2560 x 1600 with Ultimate preset and the single GTX 980 just can't keep up with the pair in the AVA Direct box. You’d have to screw up royally to make a system with an i7-5960X and dual GTX 980s perform anything other than great. AVADirect didn’t. They also didn’t overclock the system much, but it doesn’t really need it either. The company manually locked in all eight cores to run at 4GHz full-time and also goosed the system's bclock to 102MHz. PCMark 8 rated the system at 6273 and 3751, respectively, in the un-accelerated Creative and Work tests. 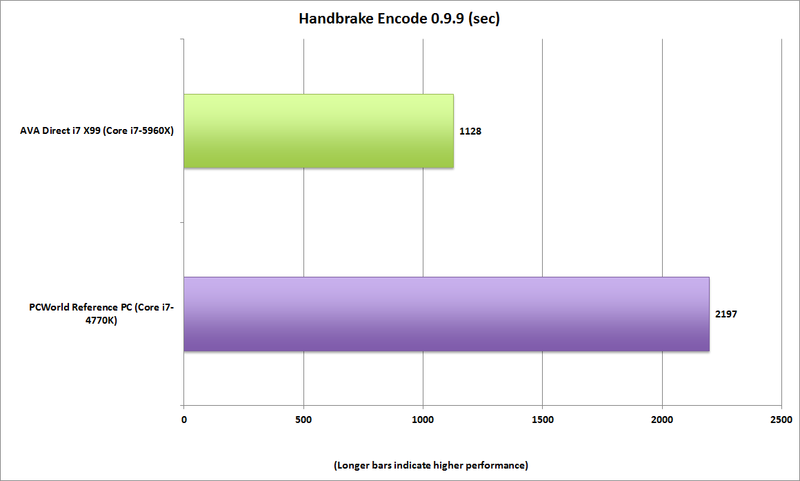 HandBrake transcoded a 30GB MP4 file to tablet format in about 21 minutes. That’s fast. If you want proof, compare that to the reference system, with its mere four cores and single GeForce GTX 980 card. The 8-core Core i7-5960X destroys the 4-core Core i7-4770K in media transcoding tests. Gaming frame rates at 2560x1600 resolution achieved far in excess of the “playable” level: 103 fps for Tomb Raider Survivors, and around 130 fps in BioShock Infinite at the highest detail levels. 3DMark results were 10502 for Firestrike Extreme (2560x1440), and 20479 for plain old Firestrike. If you need faster gaming than this, you’re in the extreme upper echelon—and about to drop another couple of grand. 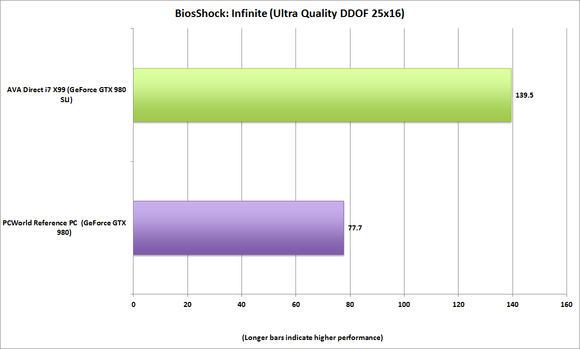 BioShock: Infinite at 2560 x 1600 resolution and set to Ultra Quality and DDOF also puts the SLI-equipped AVA Direct well ahead of our reference PC. Our i7 X99 carried a three-year parts (limited) and labor warranty and used Windows 8.1 Pro as its operating system. The limited in the warranty excludes acts of God and stupidity. If a component fails, AVADirect will replace it, assuming you didn’t try to game in the bathtub. Longer five- to six-year warranties, as well as on-site service, are also available. 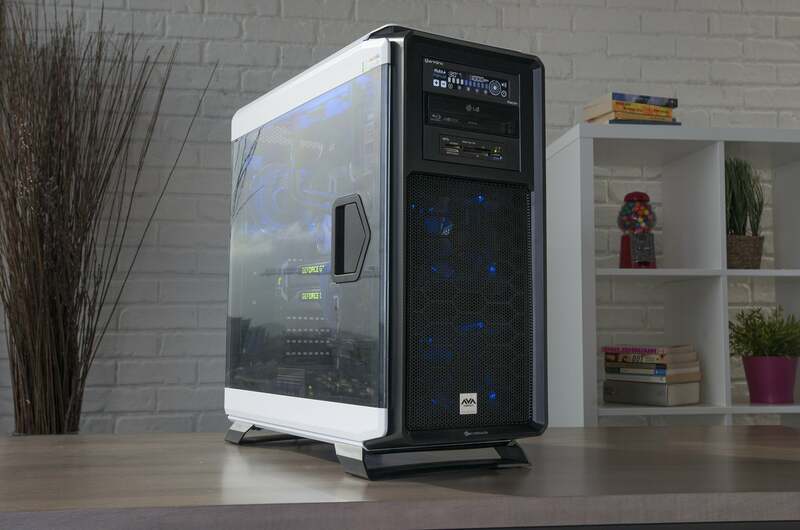 There's so much glass on the door of the Corsair Graphite 760TY case that you might as well call it a window instead. If you like to overclock harder for the sake of overclocking—there are fancier setups than our version of the i7 X99. And in point of fact, the i7 X99 can be configured to be faster, flashier, or many things. Opting for the Asus X99 Rampage V Extreme or four GPUs comes to mind. But if what you really want is to dispense with the nonsense and play, the i7 X99 configuration we tested is one worth looking into. A nicely assembled, wisely chosen set of components that games well and looks great.